The choice of ingredients is really simple, with the sauce and prawns being sauted while the pasta is being cooked. I’d used “nam phrik phao“, the Thai roasted chili jam as the base since it is also the base for tom yum goong after all. To accentuate the umami flavours, a little dried shrimp was added, first flossed with a food processor before being added to be pan-fried with the chili jam. 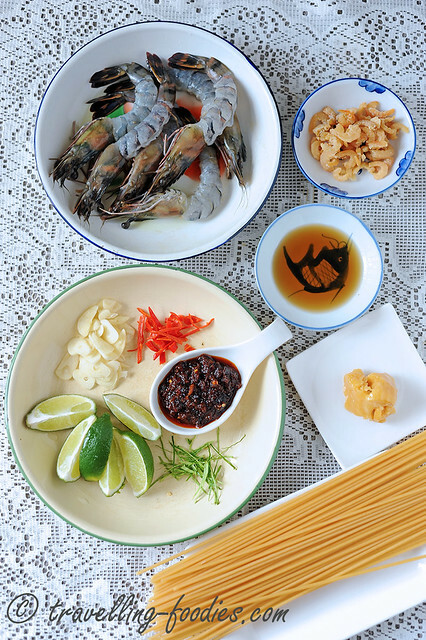 The seasoning is also kept simple, using mainly only Thai palm sugar and Thai fish sauce, which has to be mixed beforehand to dissolve the sugar into the fish sauce before adding into the sauteeing ingredients. 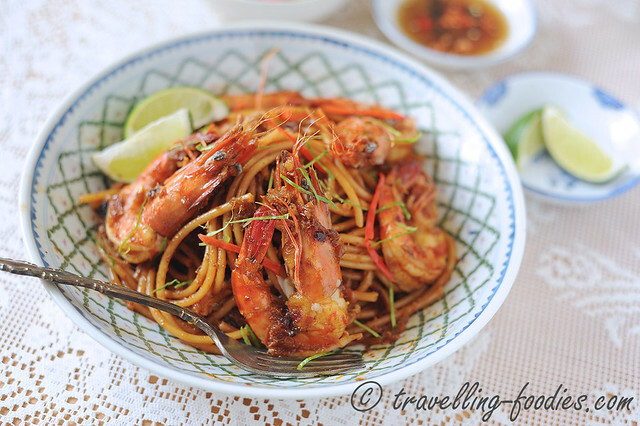 It is not before long, that the cooked pasta is added and tossed into the pan and generously coated with the sauce before a generous spritz of Thai lime juice to complete the palate profile of saltiness, sweetness, spiciness and sourness, all evident in the ever popular Tom Yum Goong. To a pot of boiling water, cook dried pasta of your choice according to instructions on packaging until just al dente. While the pasta is cooking, cook the tom yum goong sauce in a separate frying pan. First add cooking oil into the pan and saute the sliced garlic over medium low heat until fragrant and slightly brown. Add nam phrik phao chili jam, dried shrimp floss, half of julienned chili and kaffir lime leaves and pan fry slightly until fragrant as well. Be carefully not to burn the chili paste or it may become bitter. Add seasoning of fish sauce and palm sugar mixture and stir well. Add straw mushrooms, if using, as well as the peeled prawns and saute them until just cooked, when the bodies begin to curl and the head turns orange. Be careful not to overcook the prawns. Add the lime juice at this moment and coat the prawns generously with the sauce before removing them from the pan into a small plate, leaving most of the sauce still in the frying pan. Leave the straw mushrooms in the pan. When the pasta is just cooked, drain slightly with a pair of tongs over the cooking pot before adding them into the pan with sauteed sauce. Toss the pasta in the sauce until every strand is well coated. A little pasta cooking water may be added to help the sauce adhere better to the noodle strands but do not add more than 2 tbsp as this pasta creation is essentially a dry one. 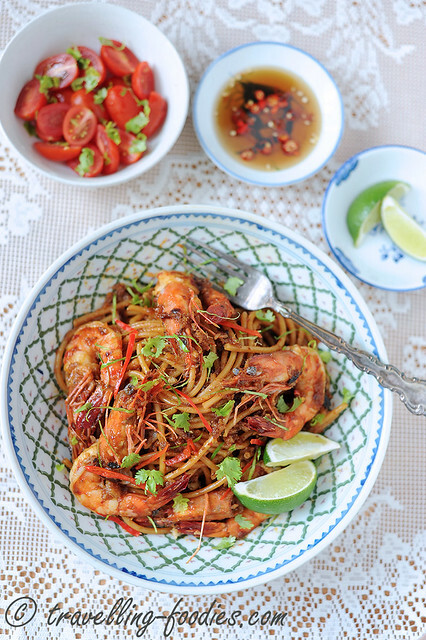 Plate the pasta amd straw mushrooms in a serving dish and arrange the prawns over them. Garnish with the remaining julienned chili, kaffir lime leaves and chopped coriander. Serve immediately with more Thai green lime wedges on the side. Squeeze the lime wedges for more juice over the pasta and toss all the topped ingredients briefly with the noodles before enjoying. This entry was posted on May 6, 2015 by Alan (travellingfoodies). 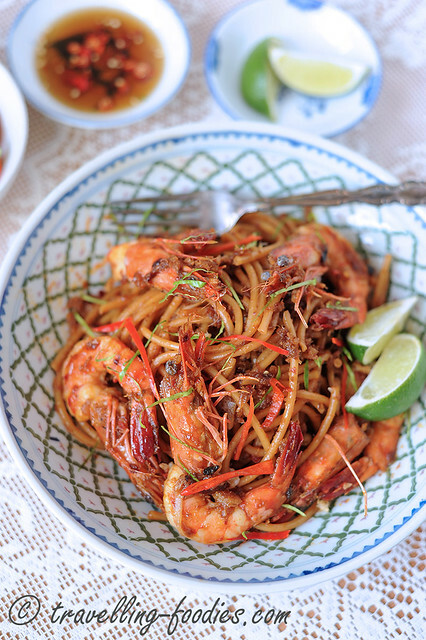 It was filed under Food, Simple Eats and was tagged with asian twist, cuisine, fish sauce, fusion, italian, kaffir lime leaves, lime nam phrik phao, palm sugar, pasta, shrimp, Thai, tom yum.